Tough guys do cry, and their water works can bring us all to tears. And isn’t a good collective sob what we really need right now? Cricket Wireless continues its relationship with WWE superstar and actor John Cena, this time pulling a prank of sorts on him. He’s usually the one surprising his fans in videos for the AT&T brand, but this time the tables are turned. 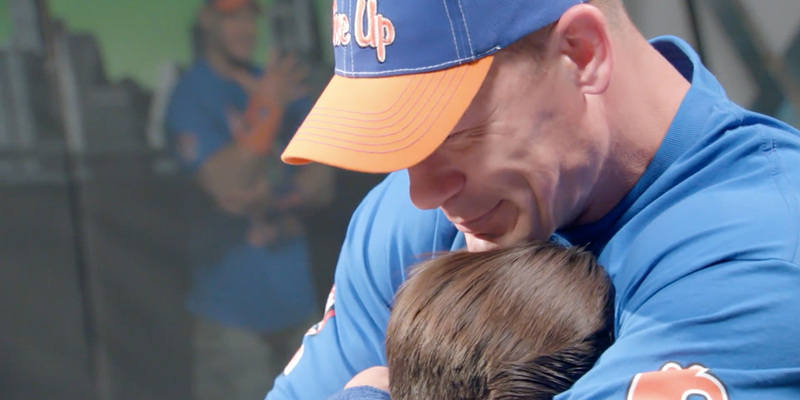 Cena, loaded down with fan mail, sits on a soundstage reading aloud the heartfelt letters about how he’s inspired people with his never-give-up message. These folks say they’ve bounced back after injuries, loss and pain because of his example. Cena is already welling up at the sentiments expressed when he’s told there’s one more thank-you note. It’s a young boy named Tyler Scheer on video talking about how Cena’s positivity helped his family through his mother’s cancer treatment. The kid had scored one of Cena’s wristbands at a WWE event, and he gave it to his mom when she went in for surgery. “She’s now cancer free,” the boy says, and Cena just loses it. Seconds later, the boy comes bursting out of a backdrop on set (with the wristband!) and rushes into the hulking wrestler’s arms. Hankies! Hankies all around! And the youngster is just one of many fans who were waiting in the wings to converge on Cena. The video, in the vein of earnest sadvertising that’s come before it, works because it unabashedly plays on our emotions, in a good way. That’s the overwhelming reaction on social media, anyway. So far, the digital short has racked up 60 million views and almost 1 million shares on Facebook, and it’s the #3 video on YouTube globally. It’s the latest in the Cricket campaign, from Los Angeles-based Shareability, called “John Cena Loves the Internet,” in which the grappler makes videos the Internet has been asking for. Look for as many as five more in the coming weeks, and see the one that started it all, if you aren’t one of the 39 million viewers who’ve already watched it, below.